At CCTV42 we have developed a series of cost effective solutions for recording vehicle registration numbers over the years. During the day recording number plates is pretty straightforward. Providing you zoom in sufficiently you will be able to make out the registration number when reviewing footage. In the UK we use highly reflective number plates and this causes a problem when filming vehicles at night. The registration plate tends to over expose because it doesn't form a large enough part of the overall image to influence the exposure. Cameras sacrifice the number plate for the greater good of the overall image and you get a bleached out white rectange instead of a readable plate. Our HD ANPR or Automotive Number Plate Recording cameras allow you to capture plates during the day or night up to a distance of about 75 meters. Click here to see the ANPR camera in our shop or to make a purchase. 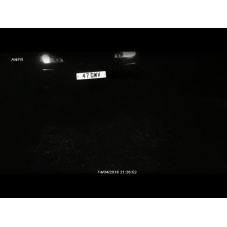 Some night time footage filmed on our ANPR3 HD 1080P CCTV camera.